Flight: July through early September. Caterpillar Hosts: Unknown but probably include oaks. Range: Southern Nevada, Utah, Colorado through Arizona, New Mexico, west Texas south into the Sierra Madre Occidentale of Mexico. 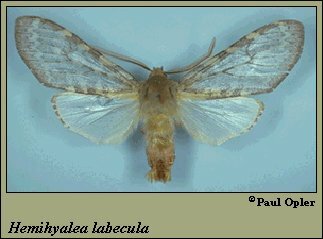 Taxonomy Notes: Previously known as: Hemihyalea labecula.